Officially they’re known as Ground Squirrels but they look more like rats wearing moth-eaten squirrel costumes. 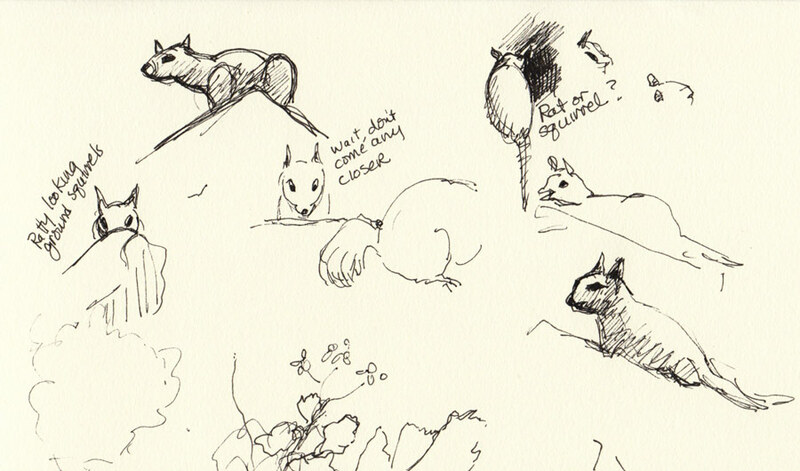 After trying to sketch them during a hike around Albany Bulb, a spit of land projecting into the SF Bay in Albany, I can say they have cute little ears and seem to be curious and playful. Their biggest selling point is that they make good snacks for the owls and other birds of prey that hunt in the area. 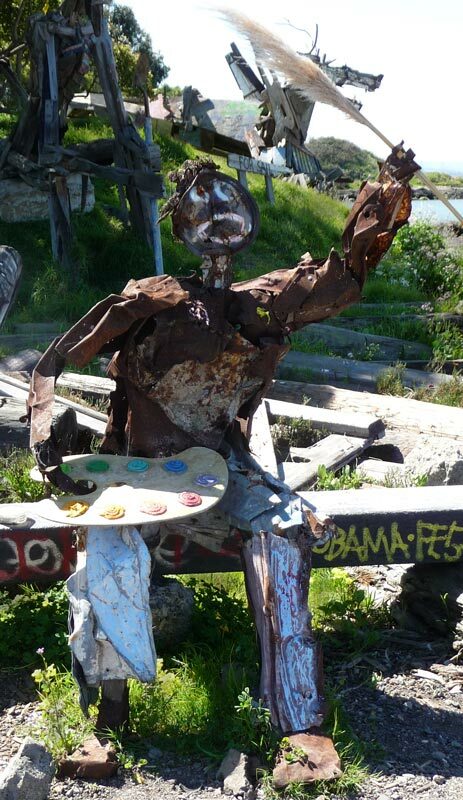 I’ve written about Albany Bulb before, so won’t go into details about this wonderful place where people make art from found objects washed up from the Bay or from the land’s original use as a dump. New art is created and people add to or decorate pieces already there. One of the regular artists who create there is writer, artist, civil rights lawyer, Osha Neumann (below, building a new sculpture). I asked him if he documents his work and he said no, but that other people sometimes take photos. I told him I thought that his work was true art, because it was made just for the pleasure of the creating, with no concern about marketing, sales, fame or glory. He just gets out there and creates. I asked what the man he was constructing was meant to be doing and he asked what I thought. It wasn’t until I saw my photo that I realized he was holding a fishing pole (duh!). My favorite new piece was the artist below, although Osha said that someone else added the palette and pampas grass “paintbrush,” they weren’t part of his original sculpture. When I saw the dog below I asked Osha where the arches with the dog atop them were that I remembered from a previous trip. He said that structure blew down over the winter and was gone. My hiking companion, 10 year old Mariah had a great time playing in the fort someone built, complete with a spiral staircase. Next time we go there we’re going to bring supplies to make our own art. This is so interesting. 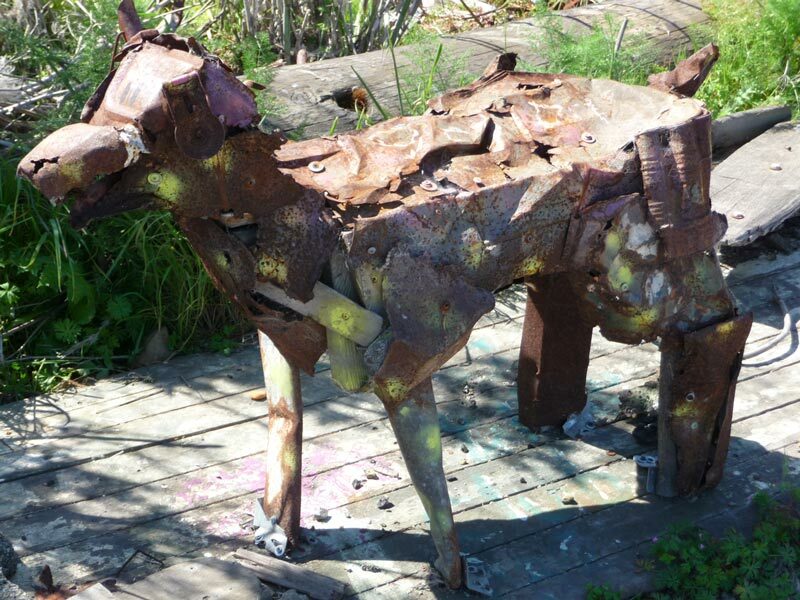 I would love to see some of the sculptures – great that you documented them. 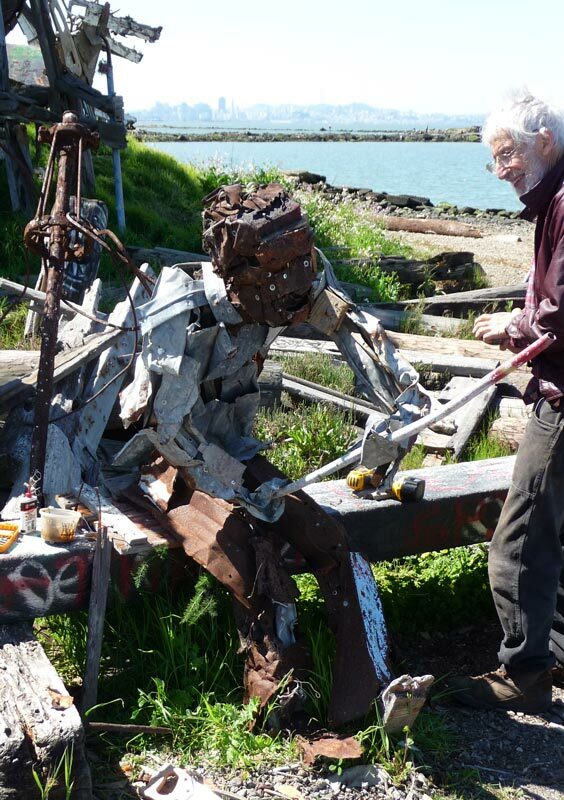 Does he do other sculpture that he sells, or is all of this his weekend passion? I shall definitely google him when I finish this comment. 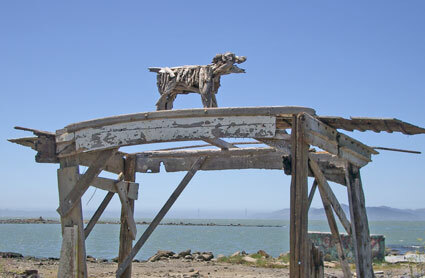 i’m posting about sculptures before your posting very interesting for me… so simple sculptures by Osha. I love it. I was so afraid you would be someone not concerned for the lowly ground squirrels which are deeply threatened, and, as you mentioned, a staple food of birds of prey. They are a favorite of the Red Tailed Hawk and they have co-evolved some specialties, like the eye set which naturally allows them to look for threats from above, and which improved the predator’s stealth as well. They cannot compete with a city though. And when you see them clinging to a pile of rocks off the side of the road, they are the old time resident and they own a lot of information we have yet to turn to knowledge. They’re actually very cute. Thank you for such a marvelous story.